Inspired by the nickname of an avatar of mine on MATY. She might be closer to my RL self than Evie, q.v. Though I usually wear more moderate glasses and do not yet have lazors in RL. She really needs a cigar, which should be thick, Columbian and chewy..
Made with game patched to 1.26. I believe the only CC I used was the nails by Natali. She will be a little less fierce without them. She has Athletic, Bookworm, Disciplined, Green Thumb, No Sense of Humour; of course you could change these. Other traits you could add include Absent-Minded, Dog lover, Computer Whiz, Born Saleswoman, Clumsy, Eco-Friendly, Hopeless Romantic, Rebellious, and Megalomaniac (though this trait does not work on a PC, sadly). 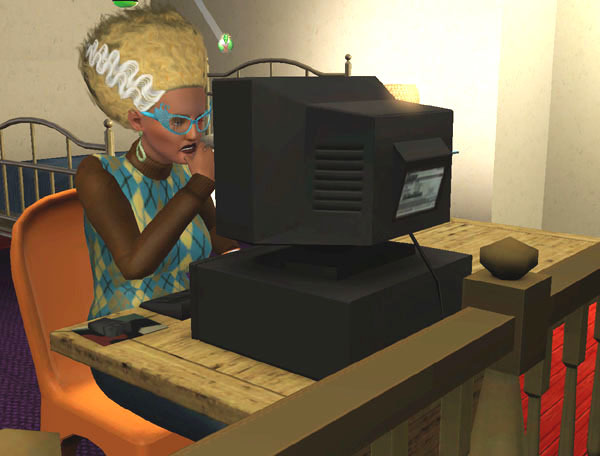 Tita stars in my Sim Survivor Story.